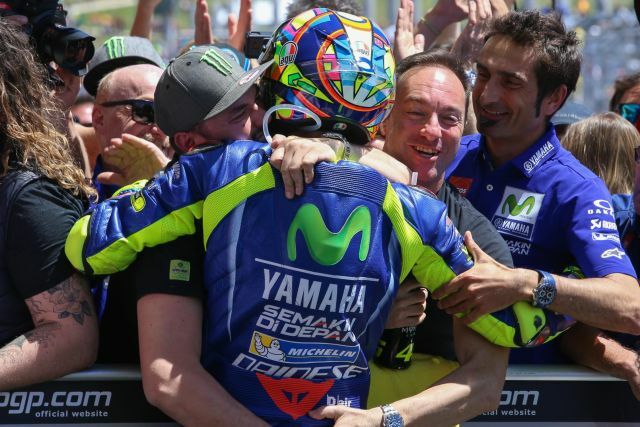 Home 2017 motogp Movistar Yamaha MotoGP Uccio Valentino Rossi MotoGP Exclusive interview with Uccio: "Valentine Rossi was monstrous at Aragon, but he is also human"
MotoGP Exclusive interview with Uccio: "Valentine Rossi was monstrous at Aragon, but he is also human"
"I strongly hope that Vale will continue"
To accompany Valentino Rossi on the track, from his first season, there has always been his great friend Alessio Salucci called "Uccio", and just before he left for the Grand Prix of Japan, scheduled this weekend, we could talk a bit with him this season. After the two offroad accidents, do you think Valentino will change his favourite workout? Unfortunately no (laughs)! In my opinion, it will not change as much as nothing changed after 2010 when it had the cross-country accident on the Cavallara track. At the time he had lost the chance to play the world for that accident, as has happened this year, and has continued to do so. However, I feel defending it, this sport is also done with some workouts and some are dangerous. A pilot completes his training at home. In my opinion, he must continue to do what he has always done, as he has done good things over the years. What did you say the first time you saw it after the accident? I saw that he was going to the hospital with the ambulance. We looked at it and it was enough to say "Cabbage, what a pity!" I did not hear of telling him anything, but to give it my support as usual. This is his job, he does it best, and to do it best, he needs to be trained, although sometimes it involves risks. How did your company comment on Aragon? He is monstrous! It always seems very normal things. On weekends we talked about motorcycle problems as well as other issues as if it had been a really normal weekend. Sometimes he forgot that he had undergone major surgery to the leg only about twenty days before. It was one of Valentino's other businesses, but let's not forget that his right leg is still at its best, so the triplet will be quite demanding for the three races, as well as for temperature and altitude changes. We also have to wait for the difficulties, Valentino is human. Do you always think that he will continue his career until 2020? I think and hope it. If he continues to have this urge to run, I do not see the reason why he should stop, otherwise, they should do so all those 20 riders who are regularly behind him every Sunday. Wave is smart enough and humble to understand the day it is time to quit. That moment has not arrived yet, I hopefully continue. We're talking about the VR46 Riders Academy, what do you do about this season? I can only say it is positive. We play four championships, the junior world in the CEV and the worlds Moto3, Moto2 and MotoGP. On four championships we've been up for three, so it's a great thing. The "Soft" (Franco Morbidelli, ndr) is in the lead at Moto2, Dennis (Foggia, ndr) also in the CEV and Valentino was there ... is positive. In the Academy, I also put Vale in, although he is no longer young and he is the founder and he is part of the group. Among the many activities you do with the Academy, what is the one you personally like? How do you live the fight of Morbidelli on the title? I was expecting it, but our sport is always difficult. Many times in the past I had expectations of this kind, but then it did not happen. I've always lived with great anxiety, I'm living by trying to give the best support to Franco and taking care of the details to the end, focusing on the objective that has not yet been achieved. How important is Valentino for the boys of the academy and how important are they for Valentino? They both have the same importance. For Vale they are very important to them, they give him the stimulus and the desire, and also like to "use them" as adversaries in training. Until a few years ago, before the Academy was born, it is true in all the workouts - the Ranch, the MiniGP, Misano - had no big opponents, rather it was quite alone. Since these little boys came, he had to make more efforts, he had to pull out more guts. For him, it is, therefore, a good added value. For kids it's important 360 degrees since they train on motorbikes, in the gym, and even when they talk to him. It's a matter of having Valentino always at their disposal, five or six hours a day.